The Group is committed to meeting the highest standards of corporate citizenship and is guided by its corporate value of conducting business with honour in order to build trust among its stakeholders. Its CSR efforts are focused on these three main areas: business operations, impact on the environment and impact on the communities where it conducts its business. The Group is committed to delivering quality, innovative developments and service across its portfolio of residential, hospitality, commercial, integrated and mixed-use developments. The Group also believes in adopting responsible management and business practices that are in line with market practices and regulatory requirements. Recognising that employees are pivotal in contributing to the Group’s success, it is committed to creating a conducive work environment which encourages employee development and involvement in the business. Over the past year, the Group has received international and national awards, in recognition of its commitment to business excellence. Changfeng Residence, the Group’s French-themed, high-end residential development in Shanghai’s Putuo District was recognised as one of Shanghai’s most influential residential developments by various property publications and dominant real estate sites in China such as Sina Leju and Sohu Focus. In Singapore, Sims Urban Oasis, the Group’s city-fringe condominium development received the Green Mark GoldPlus Award by the Building and Construction Authority (“BCA”) in 2017. The BCA Green Mark scheme is an initiative to shape a more environmentally friendly and sustainable built environment. Besides Sims Urban Oasis, the Group’s other developments in Singapore such as Tanjong Pagar Centre, Wallich Residence, Leedon Residence and Goodwood Residence have also received the Green Mark certification by BCA in previous years. GuocoLand was named as one of Singapore’s most valuable brands in June 2017. GuocoLand had climbed 4 places to 33rd place in a report by Brand Finance on Singapore’s Top 100 Brand Rankings 2017. The annual report provides an independent brand valuation analysis which conforms to ISO standards, to evaluate which brands are the most powerful and valuable. The Group’s human resource management strives to foster continuous teamwork so as to create a competitive business environment with emphasis on learning, workplace safety and employee engagement. The Group provides opportunities for staff to improve their levels of skills and knowledge to increase workplace productivity and staff satisfaction. Employees are encouraged to enrol in seminars, workshops and skills programmes to enhance their expertise and perform to their fullest potential. Staff attended seminars and training programmes covering areas on Sales, Facilities Management, Project Management, Audit, Accounting, Business Finance, Taxation, Information Technology, and Human Resources. 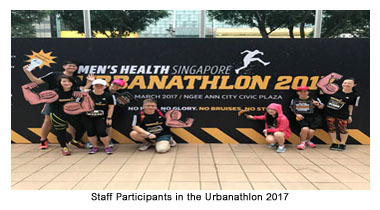 Since 2009, the Group has organised programmes to raise awareness amongst employees on the importance of workplace safety and adopting an active and healthy lifestyle. These programmes included fire evacuation exercises, annual health screenings and lunch talks on health and wellness. 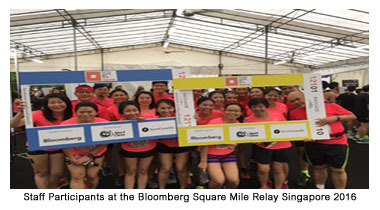 Staff also took part in the Bloomberg Square Mile Relay Singapore 2016 held in October 2016, the Urbanathlon 2017 organised by Men’s Health Singapore in March 2017 and REDAS Bowling Competition in April 2017. GuocoLand actively engages its employees through social and recreational interaction and employee bonding activities. These activities include talks on the different types of insurance policies and their purposes, improving the immune system and managing of blood pressure and cholesterol, as well as a Chinese New Year lunch where employees interacted and were updated on the organisation’s projects and direction. The Group strives to develop processes and include environmentally friendly building features wherever possible in its property developments to contribute towards environmental sustainability. Testimonies to its efforts are the green awards each development progressively garners throughout its development cycle. Sims Urban Oasis, the Group’s city-fringe condominium development in Singapore received the Green Mark GoldPlus Award by the Building and Construction Authority in 2017. 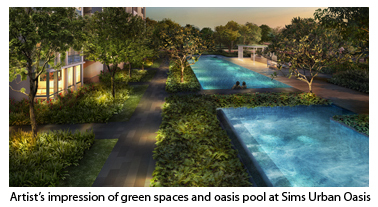 Green features in Sims Urban Oasis include the use of fully-laminated glass for East and West-facing towers, use of rainwater for irrigation with a 100% fully-automatic water irrigation system and rain sensor, motion sensor lights installed in stairwells and water-efficient washing machines provided for all units. At Martin Modern, the Group’s latest luxury residences in the Robertson Quay neighbourhood in prime District 9, GuocoLand aims to create a green sanctuary for its residents. The development will feature an expansive garden concept with over 80% of the land area turned into a lush botanic garden spread over three split levels, and with more than 200 species of plants and 50 species of trees. 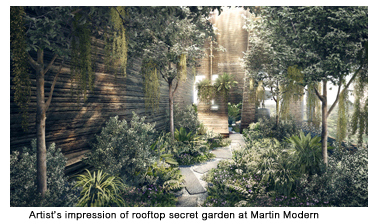 A luxurious secret garden will be created on the rooftops of the two 30-storey towers which can provide residents with a private oasis or transformed into suitable venues for hosting private parties under the night sky with views of the city and the Singapore River. Tanjong Pagar Centre, the Group’s flagship integrated, mixed-use development in Singapore, continues to stand out as one of the most environmentally friendly buildings in Singapore. With a water conservation aim of 35%, Tanjong Pagar Centre has a three-step water management strategy to minimise the waste of water. They are the usage of highly-efficient fixtures and fittings, a dual-pipe system which separates potable and non-potable water and systems to harvest rainwater and condensate water from air-conditioning. On top of these, private water sub-meters are fitted to water pipes to track water usage and leaks. More than 120 private sub-meters have been installed throughout the development which are linked to the building management system. As a socially responsible corporate citizen, the Group is cognizant of its impact on society and values the communities that it operates in. The Group has been supportive of the educational needs of children and students, donating to schools and fundraising events such as The UOB Heartbeat fund to support programmes for children from the following Singapore beneficiaries: Rainbow Centre Margaret Drive School, MINDS Fernvale Gardens School, MINDS Woodlands Gardens School and Lighthouse School. These schools provide special education for children and students with various disabilities, autism, and visual and hearing impairment. GuocoLand is also a supporter of Corporate Governance Week, an initiative by the Securities Investors Association Singapore (“SIAS”) with the aim of fostering and promoting good corporate governance practices among listed companies and all stakeholders involved. The Group recognises the importance of sustainability to its business and strongly believes in creating sustained value for its stakeholders. Going forward, the Group will look to further enhance its sustainability efforts. In this effect, the Group has formulated a sustainability committee to oversee its efforts and ensure that sustainability is managed through the organisation. The Group is currently in the process of identifying its material Environmental, Social and Governance (ESG) topics through a robust materiality assessment exercise. When the topics have been finalised, the Group will align to the Global Reporting Initiative (GRI) standards in determining the key performance indicators and targets for each of the material topics. The Group intends to publish its first sustainability report in line with the SGX requirements in 2018.